Windsor, June 7, 2017 – Labourers’ International Union of North America Local 625 announced it is hiring up to 500 construction workers over the next three weeks to bring the local labour workforce up to speed. LiUNA typically keeps a pool of workers to provide manpower to local contractors. The pool is about 300 workers short, Robert Petroni,LiUNA’s business manager, said Tuesday. “If we had them here, we could send them to work today,” Petroni said. – 3 to 8 p.m. on June 28 at the Days Inn located at 201 Erie St. N. in Leamington. Petroni said applicants should bring their resumes and be prepared for an on-the-spot interview. 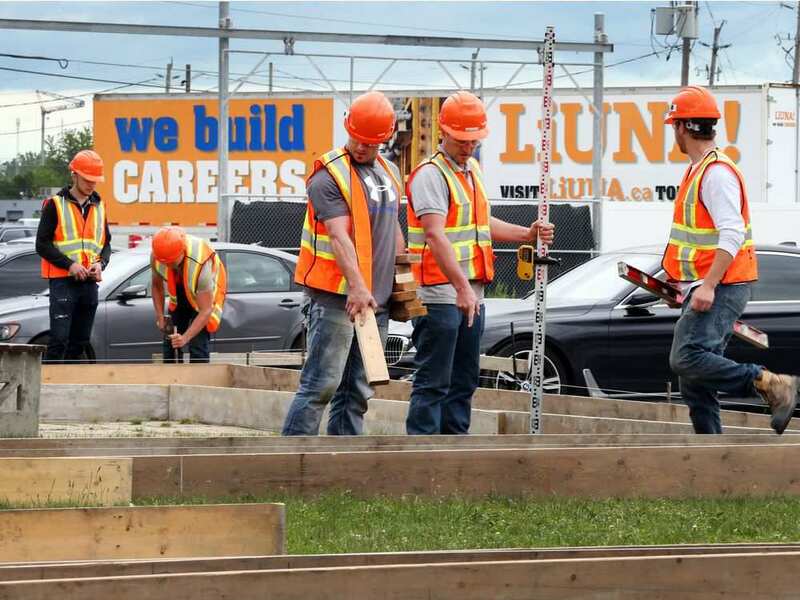 Applicants can also email LiUNA their resumes or drop them off at the union’s training centre at 2155 Fasan Dr.
“We’re looking for every position, from a cement finisher to a pipe layer to a carpenter to a master electrician,” Petroni said. A Canada-wide shortage of skilled workers means there aren’t enough people to fill available jobs, so Petroni said people with no construction experience should still apply. “If their resume is literally empty of construction experience, we can take care of that,” he said, adding that the union’s training centre will help workers gain the necessary skills. Petroni said every sector in the construction industry is different, but LiUNA members make approximately $45 an hour and many get benefits and pensions. LiUNA has about 1,500 members and their membership typically increases by 50 to 100 a year. “This year, because things are coming back on track and the economy is doing so well, we think we’re short up to about 500,” Petroni said. According to Petroni, partner contractors do about 90 per cent of construction work in the Windsor-Essex and Chatham-Kent region. That means LiUNA members work about nine out of 10 construction jobs. Despite the economic ups and downs of the last decade, Petroni said members have been working steadily. Petroni said that if the work is there, LiUNA members are too. Canadian infrastructure is becoming increasingly outdated, Petroni said. Meanwhile, the federal government is investing heavily in new infrastructure.